St. Julia was born in South Africa and raised in a Christian family. But she was captured and sold as slave. Julia served her master as she would serve Christ, doing every task to the best of her ability. Her master respected her. One day, he took her on a business trip. They stopped at an island, where the governor tried to trade four of his best slave women for Julia, because she was so beautiful and such a good worker. Her master said he wouldn’t let Julia go for any amount of money. When Julia refused to take part in the governor’s pagan worship, he waited until her master was asleep and then tried to force her to worship idols. 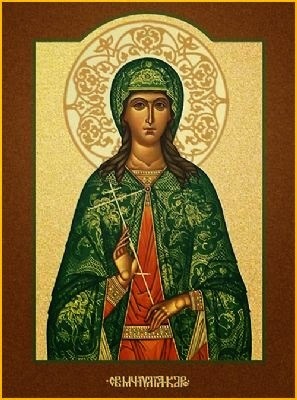 Julia remained strong in Christ, and the governor had her killed because of her faith. Because Julia was a slave, she was not able to preach to her pagan master about Jesus. Instead, she showed him what Christians were like by being honest, hard-working and devout. There are times when all Christians have to show their love for Jesus instead of using words. Today, find a way let Christ’s love shine through you in what you do and how you do it. Saint Julia, pray for us!